Echinacea Root is well known as one of the most powerful immune system builders and stimulator s! Echinacea Angustifolia Root – Naturally increases the actions and functions of the immune system. Eleuthero (Siberian Ginseng) Root – An adaptogen, that helps the body properly respond to stress. Garlic — The best broad-spectrum herb…well respected for it’s antibiotic, antiviral, anti-fungal and anti-parasitic properties. Cayenne Pepper — Capsaicin – the active component of peppers such as Cayenne, Habanero, Serrano, and Jalapeno – stimulates the body’s circulation and makes all of these already powerful herbs many times more effective! As many herbalist recommend — and especially during the shorter days of fall and winter when the sun’s presence has diminished – I like to start this and all of my tinctures, if possible, on a new moon. 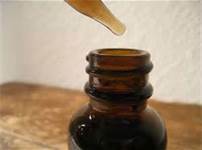 Pour the prepared tincture into a dark glass bottle and discard the herbs. 35 drops (1 dropper full) 6 times a day for a week. 70 drops (2 dropper full) every hour while awake (not to exceed 8 doses), upon show of symptoms, for 2-3 days.